A typing game that uses the Nintendo DS keyboard to play. Your character walks across a set path and wild Pokémon appear. Type their name to capture them in Typing Balls. As well as crossing different regions, each with their own selection of Pokémon, you also have to face boss battles. 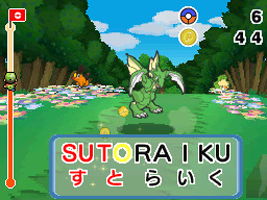 Type the letters that appear during the boss attacks to disable the attack and weaken the Pokémon. There are over 400 Pokémon to capture and a wide range of play modes and minigames to play.